Explosive Visitation or Uncanny Abnormality? Those few residents of Centerville, Ohio who were up and about around 5:30 a.m. on Saturday morning, March 6, 2004 were going about their normal routines, waiting for daylight to break. Activity at police dispatch headquarters, meanwhile, was anything but routine. Phone lines began to light up with citizen complaints of bizarre ‘flashing in the sky’ and electrical disruptions that seized a large area from Lakeview Drive to Bethel Road, Stone Lake and Linden. One after another the calls came in. “Centerville Police?” said the flustered police dispatcher to yet another caller. “Has the whole street called?” came the voice on the other line. Needless to say, this morning would not be so routine at police dispatch headquarters. This UFO was somehow interacting with power lines near Stingley Elementary School, according to the primary claimant. After each blinding explosion the air pressure in the neighborhood would “change” with a loud concussion, and at that point all the power would go out across the neighborhood. Following this disruption, the UFO would vanish from its place at treetop level near the school. The same – or a separate, identical object – would ‘reappear’ over an adjacent field as the power in the region would slowly restore. 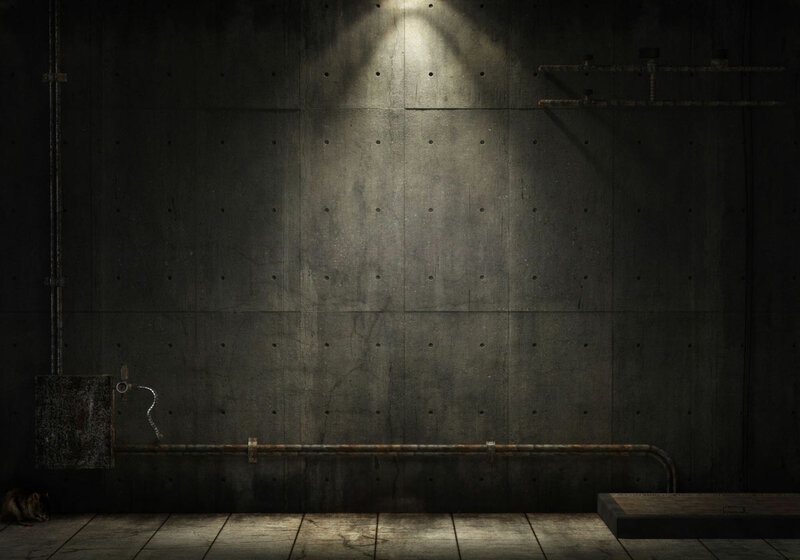 This object would then assume a slow path and amble back toward the school to its previous position where it would again explode with a flash after making some kind of ‘arcing’ contact with the power lines. This procedure, as said by the Lakeview Drive resident, would repeat several times. Following this tantalizing lead, an inquiry was made to find out if emergency responders were also witness to this UFO. Telephone greetings to the Centerville Fire Department’s “Station 41” about this issue were not warmly received, and the simple phone call requesting some basic information on the March 6 dispatch was rejected. “Why don’t you call Wright Patterson Air Force Base?” she said after listening briefly to the weird 9-1-1 tape by telephone. Like sheesh, you’d think this was an inquiry to Ft. Knox about their security methods. A friendly letter was then penned to Fire Chief Parks, basically begging to be put in contact with the emergency responders who were on the scene of the UFO incident on March 6. Chief Parks speaks and the specter of court action is now vocalized. Courtesy, begging and pleading did no good, it seems, as the firemen at the scene will continue to remain anonymous and, interestingly, a friendly chat with a UFO investigator has been averted. One for officialdom. But before the curious reader might find refreshing the idea of friendly openness and neighborly cooperation from the City of Centerville and her hirelings, there is also the attitude of Centerville’s Assistant City Manager, Judy Gilleland. “I believe I would know about downed power lines and trees and again, have heard nothing of the sort. There may or may not be a firm explanation for the object described over Stingley school, but even if it were to have been some classified military operation (Wright Patterson Air Force Base in Dayton/Beavercreek is less than 19-miles northwest), there should be some valid concern regarding a military operation so low over a residential quarter and near a school. Further, the type of propulsion method used on such a classified project and the possibility of lingering radiation near the school could pose threatening conditions for families and children in the areas of the school, Lakeview Drive, Bethel Road and Linden Road. This is and should be a sober concern. When notified of this concern and asked to undertake action to check for radiation readings, the public officials of Centerville, Ohio took no safety measures in response to the appeal for caution. As for the Lakeview Drive resident, he isn’t very comfortable with the situation. The incident early in the morning of March 6, 2004 is real. Multiple callers to police headquarters advised of an unusual situation and upon arrival, emergency responders did address the situation of arcing power lines along with downed tree limbs. But essentially the strangeness of this whole situation rests with the testimony of the Lakeview Drive resident and his wife, both claim a very sensational, physical and intelligently controlled object situated low in the sky near Stingley school. This is reflected on the emergency 9-1-1 police tapes as the caller considers his own words with disbelief at what he is claiming to observe in the sky near his home. While others in the neighborhood were indeed alarmed and also calling police headquarters, they were only reporting generic ‘flashing’ in the sky along with power disruptions. The Lakeview Drive resident further informs that officers with the fire department did tell him they saw this object too, and the instrumentation on their vehicle was oddly effected, Most unfortunately, and also quite curious, is that this cannot be independently verified as per Chief Parks’ unusually harsh reference to court action. And disturbingly, the Lakeview Drive resident also reports being sick in the last week of March, feeling nausea with a headache, a sickness he would describe as ‘low blood sugar’ even though he has never been diagnosed with this sickness. He also reports concern that his infant has experienced hair loss, although this could be normal as babies sometimes do lose their hair. Or then again, perhaps it’s just those high winds. 12. E-mail comments by Assistant City Manager Judy Gilleland (March 29) and letter by Fire Chief Kenneth C. Parks (April 1) advising that high winds throughout Washington Township caused wires to arc. CALLER 1: Yeah, this is a non-emergency call. CALLER 1: Um, I’m over on Bethel Road,and you’ve probably had a few people call you but I just wanted to make sure. Our electricity keeps flickering, and I see out the window the skylight up and something loud like a transformer humming… have you been made aware of that? DISPATCHER: No, nobody’s called on that.Is it behind your residence that you are seeing this? DISPATCHER: I’m sorry, let me get this 9-1-1 call, just a moment. 9-1-1 police, fire and medical? 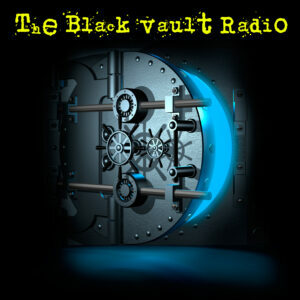 CALLER 2: Yes, my name is Dennis Wills (sp?) 174 Linden Drive, Centerville, we’re getting loud or large electrical flashes off the power supply system behind our house? DISPATCHER: Okay, on the other line I just had someone from Bethel Road and he is seeing the same thing. Isyour electricity flickering? CALLER 2: Yes, it comes on and off and we’re getting a huge flash. And it’s done this about four times. DISPATCHER: A flash, where outside? CALLER 2: Yes outside, and the lights just all came back on again. CALLER 2: We think it is immediately close. I was trying to call DP&L, but there’s just a huge, computerized’no person’ phone line. CALLER 2: I haven’t actually been able to see it actually arc, we just see a huge flash. DISPATCHER: Okay, we’ll send someone out. Okay sir? CALLER 2: Okay, thank you very much. DISPATCHER: (to first caller) My other call was about the same thing, he lives on Linden Drive. And he is seeingflashing, maybe by his treeline. I’m sorry, I have another 9-1-1 call,what is your address on Bethel? DISPATCHER: 105, thank you sir. Bye.9-1-1, police, fire-medical? CALLER 3: Ahhh… has the whole street called? DISPATCHER: No sir, what is this about? DISPATCHER: What is your address, I’m getting more calls on this! CALLER 3: 166 Lakeview… holy crap…are you…. there is something in the sky! DISPATCHER: Okay, just one moment sir! DISPATCHER: Okay, all right. About flashing? CALLER 4: Yes. That’s correct. DISPATCHER: Okay… all right, we’re going to check this out sir. CALLER 4: Okay, we’re not the first to call then? DISPATCHER: No, no sir. Thank you. CALLER 4: Okay, bye bye. CALLER 5: Ah yes, do you happen to know what’s going on in our neighborhood. DISPATCHER: No, we’re having an officer in the area, what is your address? DISPATCHER: Allright, I’m sorry, just one moment. Okay, we’ll be in the area.. do you see where it’s coming from? DISPATCHER: I’m sorry… what school? DISPATCHER: All right, okay. Thank you. DISPATCHER: I’m sorry, I’ve had about 10 calls since then. CALLER 3: What did they say? CALLER 3: I saw it! We both, my wife and I both saw it and it was right outside our window! DISPATCHER: Right, okay. And your address again sir? DISPATCHER: Okay, all right… that’s allright. I’ve gotten about ten calls here. CALLER 3: Are they saying its the same thing that I’m saying it is? CALLER 3: It looked like a freakin’ alien ship. CALLER 3: And it blew up, and it was like a bomb going off. DISPATCHER: Okay, was it pink? DISPATCHER: A lady said it was pink. CALLER 3: …and then it would just go ‘boom’ and the whole all the electricity would go off and this giant flame ball in the sky. DISPATCHER: Okay, I need to get going and let the officers know, okay? DISPATCHER: Okay, thank you, bye bye. 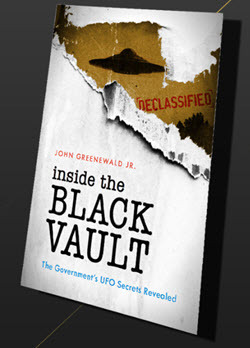 Background/Objective: An unusual event happened in Centerville, Ohio at approximately 5:30 a.m.Saturday morning March 6, 2004. Residents saw a UFO apparently interacting with power lines. The extent of the interaction was explosive innature, and also involved the burning of tree tops. Flame and ‘glitter’from the trees were purported to continue for several hours after the event. A detailed account of the UFO’s movements and witness ís descriptions can be found on http://home.fuse.net/ufo The object of this analysis is to analyze the exposed tree branches for any unusual or foreign materials. Following are photographs of the branches. 1.) No unusual or foreign materials were detected on the charred and unburned areas of the branches. The results show normal natural products from trees and normal burn byproducts. The natural products include primarily celluloidal material, some natural ester, a small amount of secondary amide, and trace amounts of possible natural carboxylic acid salts. Burning byproducts include carbon,calcium carbonate, calcium phosphate, inorganic nitrate, and organic oxidation products, which are primarily carboxylic acid salts. 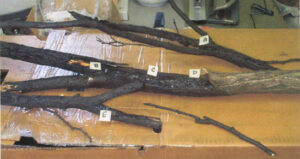 Samples: Several charred tree branches from the event were sent. Numerous infrared spectra were obtained from both burn and unburned areas of the tree branches “as received”. These were obtained on the Nicolet Avatar 360 spectrometer using the Harrick SplitPea ™ sampling accessory. Some of the selected sampling areas of a branch are shown in the photograph below. 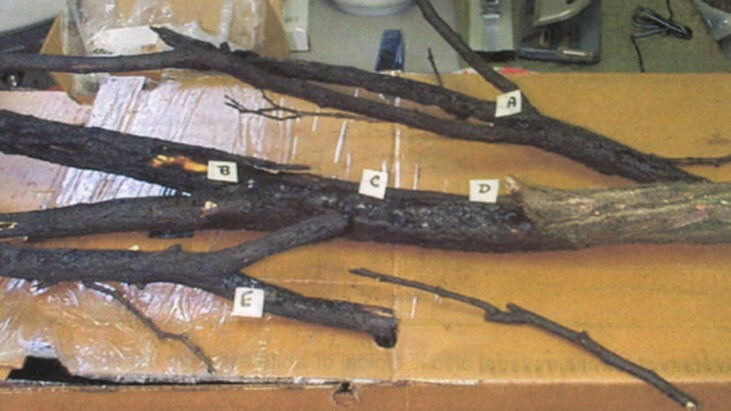 In addition, infrared spectra were also obtained from solvent extractions from the charred and unburned sections of the branches, as well as a control branch. Progressively polar solvents were used, i.e. hexane, 1:1 acetone:methanol and water. The extracts were weighed for a quantitative estimate of their amounts. The branches were also examined with a radiation monitor (SE International’s Radiation Alert ™ Monitor 4) and a UV light (Optical Engineering’s Model 22-UV). The results of the individual tests done on the branches follow. These results are summarized in the conclusionssection of this report. Analysis of the Branches “As Received”Infrared analysis of the charred areas of the branches shows products typical of burned wood. Carbon, calcium carbonate, sometimes organic oxidation products and inorganic nitrate are noted. The amounts of these materials vary and depend on the degreeof burning the sample area of the branch experienced. The spectra follow. A spectrum of a white material also is typical of white ash from a fireplace. The major component is calciumcarbonate, and there is a smaller amount of calcium phosphate. (The carbon is completely gone because of complete oxidation.) Following is a spectrum of the branch white material and a reference of white ash from the Budinger fireplace for comparison. 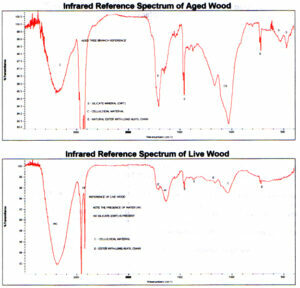 Infrared spectra from unburned areas of the branch show typical celluloidal material and natural ester. For the most part the spectra of the unburned area compare qualitatively to reference control spectra of aged and new wood. (It should be notedthe aged wood additionally contains some mineral silicate (dirt).) However, due to the differences in wood sources and ages of the controls before data acquisition, the quantitative amounts of the components vary. Following are two spectra from unburned branch areas and reference spectra of an aged piece of wood and live wood for comparison. 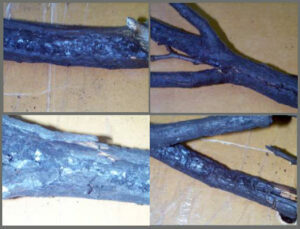 The “as received” charred and unburned areas of the branches were examined with a UV lamp for any unusual fluorescing material. None was detected. These areas were also scanned with a radiation monitor. There was nothing detected above backgroundradiation. Analysis of Solvent Extracts from the SamplesThe amounts of solvent extractable materials using progressively polar solvents (hexane, 1:1 acetone:methanol, water)from the charred and unburned areas of the branch as well as a control follow. * Some carbon fines present. Expectedly, more material is extracted from the charred area than the unburned area because of the increase insoluble burn byproducts (oxidized organics). (See infrared analysisbelow.) Comparison of the control extract amount to the charred and unburned amounts vary and may be accounted for by the differences in wood types and wood age when the extraction was done. 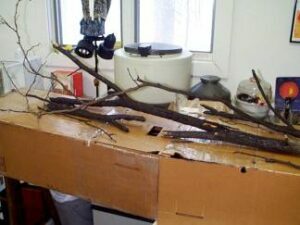 That is, extractions of the branches were done 20 days after the event, and the control was done the same day it was cut. 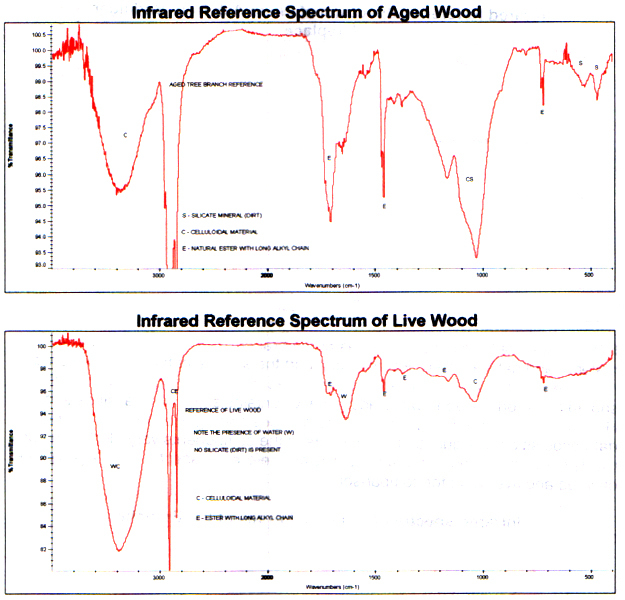 However, as the infrared analysis shows below, the control compositionally compares closely to the unburned wood. Infrared analysis shows the hexane extracts from the unburned area compare to that of the control. That is, thesame components are present. These consist of celluloidal materialand natural ester. However, the quantitative amounts vary.There is less soluble celluloidal material in the unburned branch area. Following are the spectra of these two extracts. The hexane extract from the charred areais expectedly different. This is because of a chemical change as a result of the burning action. The infrared spectrum shows long chain natural ester and a trace amount of poly(dimethylsiloxane) contamination. This is a common contaminant and is probably from the aluminum pans usedin the experiment. There is no longer any celluloidal material. The spectrum follows. Infrared spectra of the acetone:methanolextract from the unburned area compare well to that of a control. The same components are detected with very subtle quantitative variations. The spectra show mostly soluble celluloidal material and smaller amounts of natural ester and possibly carboxylic acid salts. The spectra follow. The spectrum of the acetone:methanol extract from the charred area is different and displays highly oxidized carboxylicacid salts. These are byproducts of the burning (oxidation). The spectrum follows. Infrared analysis of the water extracts from the unburned area and the control show they contain similar components. The amounts appear to vary. Identified are celluloidal material,carboxylic acid salts, and secondary amide. A trace amount of poly(dimethylsiloxane)contamination is found uniquely in the unburned extract. Infrared analysis of the extract from the charred area shows primarily carboxylic acid salts which are definitely a product of the burning. The spectrum follows. UFO Sighting over Amelia, OH (2004) Sasquatch Carving?